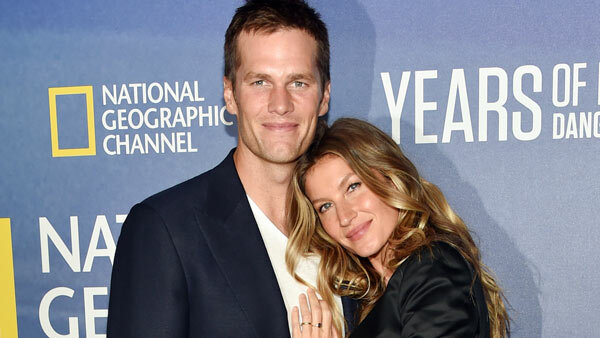 BOSTON -- Tom Brady played through a concussion last year on his way to a fifth Super Bowl title, according to his wife, supermodel Gisele Bundchen. The injury, which was not reported by the team, left her worried about how long he should continue to play football. Asked if she wanted the New England Patriots quarterback to retire, Bundchen expressed concern "as a wife" in an interview on "CBS This Morning" that aired Wednesday. "He had a concussion last year. He has concussions pretty much every ..." she said, before cutting herself off. "I mean, we don't talk about it. But he does have concussions. I don't really think it's a healthy thing for anybody to go through." Brady sat out the first four games of the season as punishment for his role in the "Deflategate" scandal and missed practice late in the season for leg, thigh and ankle injuries. But he was not listed on the league-required injury reports for a concussion or head injury at any point during either the 2016 calendar year or the 2016 season. The NFL requires "significant or noteworthy" injuries to be reported, regardless of whether a player is expected to miss playing time, and says honest reporting of injuries "affects the integrity of the game." The league is especially - though belatedly - sensitive to concussions, which have been linked to a brain disease that leaves former players forgetful, violent or suicidal. The NFL has agreed to pay $1 billion to retired players who accused the league of concealing the link between football and brain damage. Neither the Patriots nor the NFL would respond to Bundchen's comments on Wednesday. Brady's agent did not immediately respond to a request for comment. Chris Nowinski, a founder and the CEO of the Concussion Legacy Foundation, said only a small percentage of concussions are diagnosed, whether in the NFL or elsewhere. "I'm most surprised that people think it's really news that an NFL player had a concussion but it wasn't diagnosed and it wasn't reported," he said Wednesday from the VA-sponsored Brain Trust conference at Harvard Medical School. "But it is a great opportunity to educate people that it's very dangerous to play through a concussion. And if you have an opportunity to get off the field and get it taken care of, you need to take it." By winning his fifth NFL title at the age of 39 - leading the biggest Super Bowl comeback in history - Brady has already defied age and cemented himself among the league's all-time greats. He has long said he wanted to keep playing until his mid-40s, but he told ESPN in an interview published this week that he would continue beyond that if he was able to stay healthy and productive. But Bundchen balked at those plans when asked by CBS host Charlie Rose about her husband's plans. "That kind of aggression all the time, that cannot be healthy for you," she said. "I'm planning on him being healthy and do a lot of fun things when we're like 100, I hope."